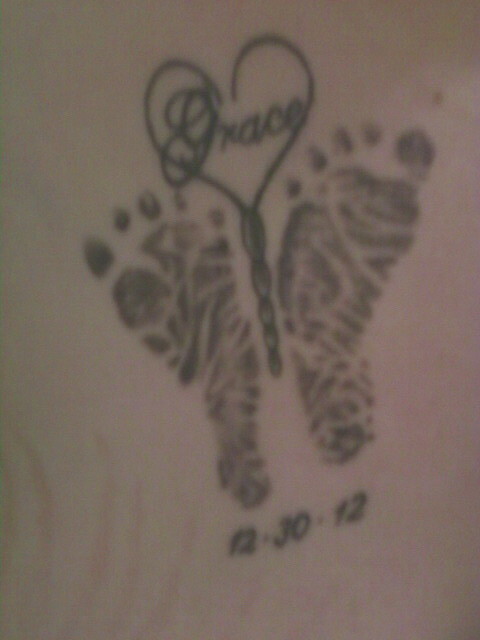 I absolutely love my new tattoo I got in memory of Grace. I had it done about 11 days ago. After Grace died, the hospital gave me a few copies of her footprints on the back of pink cards that contained info about her. I saved the best one I had in a ziploc bag, and put in the back of her scrapbook. I knew right away that I wanted to tattoo her feet on me somewhere. So with Jim and Laura, we found a tattoo place that could take a walk in right away. I explained to my artist, E, that I wanted her feet to form butterfly wings. I also told him she was stillborn, and he gave me the obligatory “I’m sorry” with a grimace on his face. To be honest it didn’t bother me. I didn’t want to talk about her with him. He sat down and designed my tattoo with her footprints. An hour later, I was freshly inked and ready to show it off. It’s definitely my most visible and meaningful tattoo. It seems that this was a big step for me in my grief, because I feel much calmer and at peace now. Partially because I am coping and adjusting to living without her, but also because I feel like I am carrying her with me wherever I go. I’m off anxiety meds and weaning off my anti-depressant. I feel better and I would like to try life without medication for a while. It’s been nearly 9 months since Grace died and I still miss her every day. But I no longer feel as if the loss and the pain are going to suffocate me.